14 | TH E M R EP O RT COVER STORY Left to right: Darius Kingsley, Managing Director and Co-General Counsel for Mortgage Banking; Lela Wingard, Head of Community Reinvestment & Community Partnerships; Mike Weinbach, CEO of Mortgage Banking; Jackie Frommer, Head of Shared Services for Mortgage Banking; Maribeth Robinson, Head of Human Resources for Mortgage Banking; and David Beck, CFO for Mortgage Banking By: Xhevrije West T o say Chase Bank is big would be an understatement. After all, the bank- ing behemoth has worldwide opera- tions and assets totaling $2.6 trillion. Although almost half of American households do some form of business with Chase—whether personal banking, small business lending, credit card services, auto financing, in - vestment advice, or mortgage lending—it's unlikely that many have put much thought into the leader- ship helm behind the Chase name. However, despite it's size, Chase is far from a name- less, faceless corporation. Like any good story, there is more to Chase than what is on the surface—namely the professionals who make up the lifeblood of the company. Chase is home to the elite, the best in the field, and the company's employees happily welcome the challenge of tackling today's regulated market. One such professional is Mike Weinbach, the recently appointed CEO of Mortgage Banking at Chase. A wunderkind in his position at only 42, Weinbach is ushering in a new era. The Chase mort - gage department is shifting its focus to make home- ownership a possibility for millions of Americans. The Beginnings of Weinbach's Chase A ppointed to lead Chase's mortgage banking division in December 2015, Weinbach previ- ously served as Head of Mortgage Servicing and has been with the company since 2004, when Chase merged with Bank One. With a Bachelor of Science from The Wharton School already under his belt, Weinbach began his career in financial services 20 years ago when he be- came a mergers and acquisitions investment banker at Smith Barney. It was while working on a number of deals for Citigroup that Weinbach decided to enroll in business school at Harvard. During a short stint away from financial services, he started U-inspire, a company focused on employee motiva - tion and communication services. "It was a great experience, but after several years of the highs and lows of entrepreneurship, I was ready to join a company where I would have a big - ger platform to drive change. It was at this point, I realized that I really enjoyed financial services," Weinbach said. 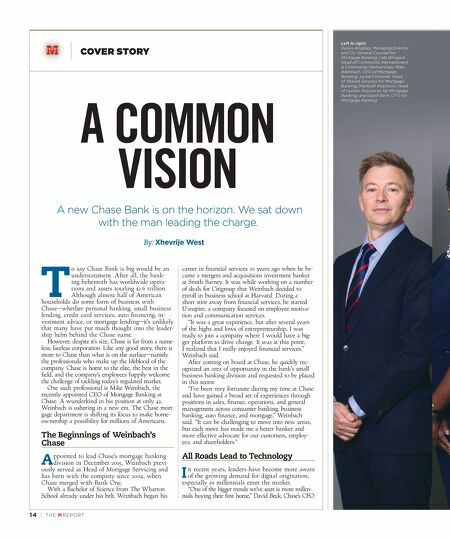 After coming on board at Chase, he quickly rec - ognized an area of opportunity in the bank's small business banking division and requested to be placed in this sector. "I've been very fortunate during my time at Chase and have gained a broad set of experiences through positions in sales, finance, operations, and general management across consumer banking, business banking, auto finance, and mortgage," Weinbach said. 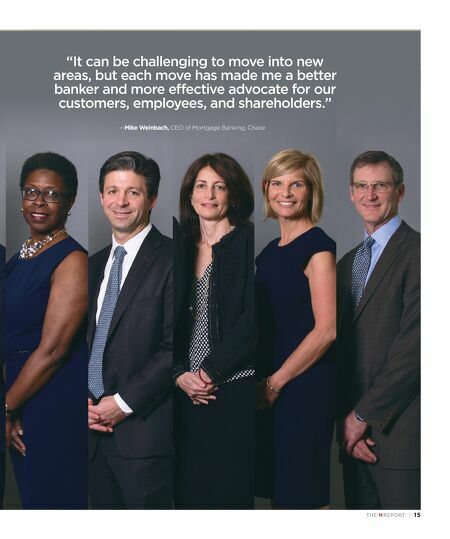 "It can be challenging to move into new areas, but each move has made me a better banker and more effective advocate for our customers, employ - ees, and shareholders." All Roads Lead to Technology I n recent years, lenders have become more aware of the growing demand for digital origination, especially as millennials enter the market. "One of the bigger trends we've seen is more millen- nials buying their first home," David Beck, Chase's CFO A COMMON VISION A new Chase Bank is on the horizon. We sat down with the man leading the charge.